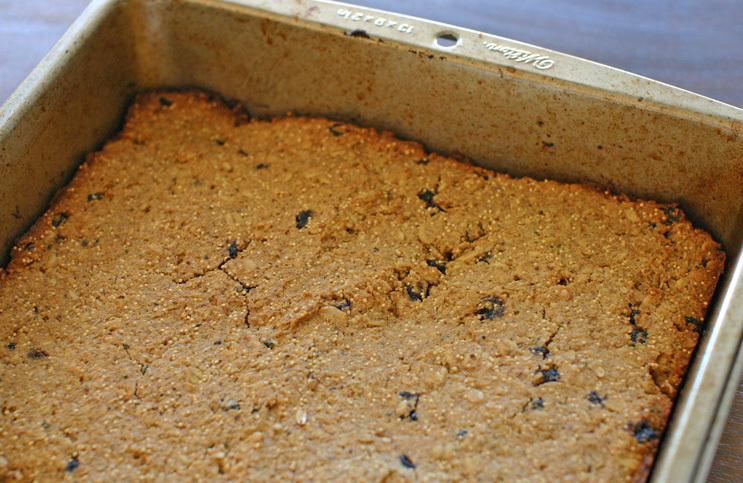 Make a batch of these bars over the weekend and have them on hand for the rest of the week. 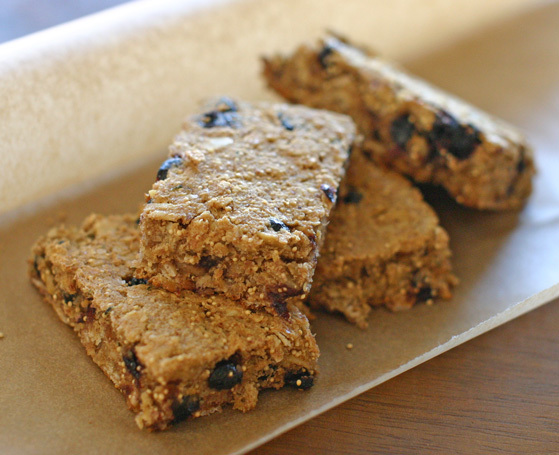 They make a lovely breakfast-on-the-go, and the combination of oats, almonds, oat bran, coconut flour, flax seed, hemp seed and amaranth means that these little bars are not only filling, they are packed full of healthy protein that will power you right on through ’til lunch. They are only slightly sweetened by the dates, banana and modest amount of maple syrup, making them particularly appropriate for morning time, but if you prefer sweeter baked goods, there is a recipe below for a nice icing you can drizzle over top. These also make an excellent mid-afternoon snack. This recipe is a great way to use the almond pulp you have left over after you make your own almond milk, as the milk recipe should yield just the right amount of almond pulp for these bars. But if you haven’t made your own milk recently, you can substitute regular almond meal or almond flour in place of the pulp. Preheat the oven to 350°F. Lightly grease a 13×9-inch pan with coconut oil. In a food processor, blend the soaked dates and the overripe banana until you have a smooth puree. Transfer to a large bowl and add the applesauce, vanilla extract, melted coconut oil and maple syrup. Grind the flax seed (I always grind my flax seed fresh in a Magic Bullet blender – see nutrition section below – but you can also use pre-ground “flax seed meal”) and stir it into the wet ingredients, along with the cinnamon and salt. Stir in the almond pulp. Next, add in the rolled oats, oat bran, coconut flour, hemp seeds and amaranth, and mix thoroughly. Finally, fold in the dried blueberries. 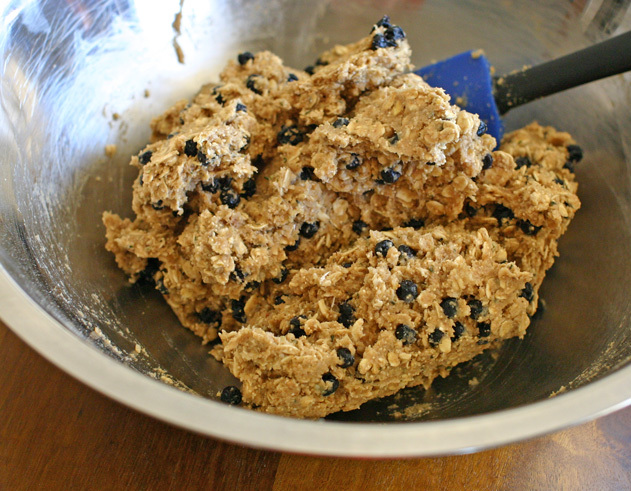 You will have a thick, dough-like batter. Press the batter evenly into the prepared pan. The more evenly you spread the batter, the more evenly it will bake. Slide the pan into the preheated oven and bake for 40-45 minutes, or until a toothpick pressed into the center of the cake comes out clean. The edges will be slightly browned. Once the pan has cooled, you can cut the cake into bars and serve. Store them in the fridge in a sealed container or Ziploc bag for up to five days. 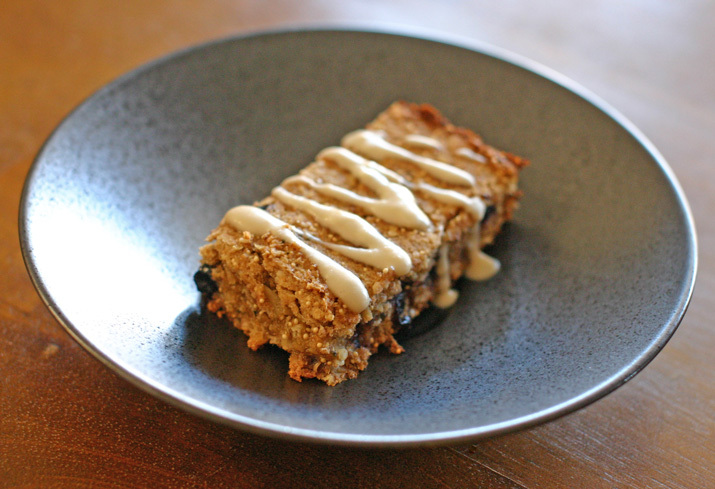 Whisk the coconut cream, maple syrup and vanilla into a thick puree, and then stir in just a splash of almond milk or lemon juice until it is liquid enough that you can drizzle it over the banana blueberry oatmeal bars. Alternatively, you can leave the icing thick and spread it with a knife over the bars. I prefer to apply the icing to these just before serving (rather than right after baking), because they stack and store a lot more easily without the icing. The icing will stay in the fridge in a separate sealed container for a few days, too, but it will become firm when cold, so you may need to allow it to warm to room temperature before it returns to a drizzle-able consistency. Oat bran is the outer husk of the oat grain and its highly nutritious. It is an excellent source of dietary fiber, as well as protein (a half cup contains 8g of protein) and a bunch of vitamins (thiamin, riboflavin, folate and pantothenic acid) and minerals (iron, magnesium, phosphorus, potassium, zinc, copper, manganese and selenium, all in significant quantities). 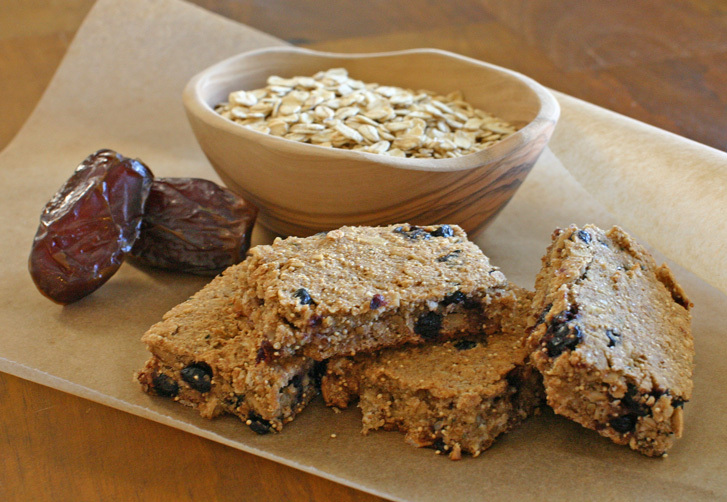 4 Responses to "Banana Blueberry Oatmeal Breakfast Bars"
This recipe looks really yummy! I can’t wait to make them. A good snack for me to take to work and a healthy snack for my kids. Thanks! Thanks for the great recipe! Cormac and I whipped up a batch this morning. Very tasty. Thanks, Christine! They do transport pretty easily. Hope you enjoy them!